For other uses, see Narva (disambiguation). Narva (Estonian pronunciation: [ˈnɑrʋɑ], Russian: Нарва) is the third largest city in Estonia. It is located at the eastern extreme point of Estonia, at the Russian border, on the Narva River which drains Lake Peipus. People settled in the area from the 5th to 4th millennium BC, as witnessed by the archeological traces of the Narva culture, named after the city. The fortified settlement at Narva Joaoru is the oldest known in Estonia, dated to around 1000 BC. The earliest written reference of Narva is in the First Novgorod Chronicle, which in the year 1172 describes a district in Novgorod called Nerevsky or Narovsky konets (yard). According to historians, this name derives from the name of Narva or Narva River and indicates that a frequently used trade route went through Narva, although there is no evidence of the existence of a trading settlement at the time. The favourable location at the crossing of trade routes and the Narva River was behind the founding of Narva castle and the development of an urban settlement around it. The castle was founded during the Danish rule of northern Estonia during the second half of the 13th century; the earliest written record of the castle is from 1277. Narvia village is mentioned in the Danish Census Book already in 1241. A town developed around the stronghold and in 1345 obtained Lübeck City Rights from Danish king Valdemar IV. The castle and surrounding town of Narva became a possession of the Livonian Order in 1346, after the Danish king sold its lands in Northern Estonia. In 1492 Ivangorod fortress across the Narva River was established by Ivan III of Moscow. Trade, particularly Hanseatic long distance trade remained Narva's raison d'être throughout the Middle Ages. However, due to opposition from Tallinn, Narva itself never became part of the Hanseatic League and also remained a very small town – its population in 1530 is estimated at 600–750 people. Captured by the Russians during the Livonian War in 1558, for a short period Narva became an important port and trading city for Russia, trans-shipping goods from Pskov and Novgorod. Russian rule ended in 1581 when the Swedes under the command of Pontus De la Gardie conquered the city and it became part of Sweden. During the Russo-Swedish War (1590–1595), when Arvid Stålarm was governor, Russian forces attempted to re-gain the city without success (Treaty of Teusina, May 1595). During the Swedish rule the Old Town of Narva was built. Following a big fire in 1659, which almost completely destroyed the town, only stone buildings were allowed to be built in the central part of the town. Incomes from flourishing trade allowed rebuilding of the town center in two decades. The baroque Old Town underwent practically no changes until World War II and became in later centuries quite famous all over Europe. Towards the end of Swedish rule the defence structures of Narva were greatly improved – beginning in 1680s, an outstanding system of bastions, planned by the renowned Swedish military engineer Erik Dahlbergh, was built around the town. The new defence structures were among the most powerful in Northern Europe. 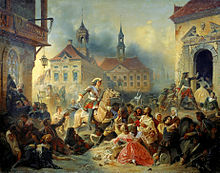 During the Great Northern War of 1700–1721, Narva became the setting for the first great battle between the forces of King Charles XII of Sweden and Tsar Peter I of Russia (November 1700). Although outnumbered four to one, the Swedish forces routed their 40,000-strong opponent. Russia subsequently conquered the city in 1704. After the war, the bastions were renovated. Narva remained in the list of Russian fortifications until 1863, though there was no real military need for it. During Russian rule Narva formed part of the Saint Petersburg Governorate. In the middle of the 19th century, Narva started to develop into a major industrial town. Ludwig Knoop established the Krenholm Manufacturing Company in 1857. The factory could use the cheap energy of the powerful Narva waterfalls, and at the end of the century became, with about 10,000 workers, one of the largest cotton mills in Europe and the world. In 1872, Krenholm Manufacturing became the site of the first strike in Estonia. At the end of the 19th century, Narva was the leading industrial town in Estonia – 41% of industrial workers in Estonia worked in Narva, compared to 33% in Tallinn. The first railway in Estonia, completed in 1870, connected Narva to Saint Petersburg and to Tallinn. In August 1890, Narva was the site of a key meeting between German Kaiser Wilhelm II and Russian Tsar Alexander III. The status of Narva was finally resolved in a July 1917 referendum, when the district population, now roughly equally divided between ethnic Russians and Estonians, voted to attach itself to the newly autonomous and soon to be independent republic of Estonia. Narva became part of an independent Estonia in 1918, at the end of World War I. The town saw fighting during the Estonian War of Independence. The war started in Narva on 28 November 1918; on the next day the city was captured by the Red Army. Russia retained control of the city until 19 January 1919. Heavy battles occurred in and around Narva in World War II. The city was damaged in the German invasion of 1941 and by smaller air raids throughout the war, but remained relatively intact until February 1944. However, as the focus of the Battle of Narva, the city was destroyed by Soviet bombardment and fires and explosions set by retreating German troops. The most devastating action was the bombing raids of 6th and 7 March 1944 by the Soviet Air Force, which destroyed the baroque old town. By the end of July 98% of Narva had been destroyed. After the war, most of the buildings could have been restored as the walls of the houses still existed, but in early 1950s the Soviet authorities decided to demolish the ruins to make room for apartment buildings. Only three buildings remain of the old town, including the Baroque-style Town Hall. The civilian casualties of the bombing were low as the German forces had evacuated the city in January 1944. The original native inhabitants were not allowed to return to Narva after the war and immigrant Russian-speaking workers from other parts of the USSR were brought in to populate the city. The main reason behind this was a plan to build a secret uranium processing plant in the city, which would turn Narva into a closed town. Although already in 1947 nearby Sillamäe was selected as the location of the factory instead of Narva, the existence of such a plan was decisive for the development of Narva in the first post-war years and thus also shaped its later evolution. The planned uranium factory and other large-scale industrial developments, like the restoring of Kreenholm Manufacture, were the driving force behind the influx of internal migrants from other parts of the Soviet Union, mainly Russia. In January 1945 Ivangorod, a town across the river which was founded in 1492 by Tsar Ivan III of Russia, was separated from Narva and was made part of the Leningrad Oblast in the Russian SFSR. Ivangorod received the official status of town in 1954. The Town Hall, surrounded by Soviet-era apartment blocks, is one of the few buildings which were restored after World War II. When Estonia regained its independence in 1991, Narva again became a border city. Local leaders, holdovers from the Soviet era, wanted autonomy, and contended that the notion of a breakaway 'Transnarovan SSR' republic in northeastern Estonia was becoming increasingly popular, but this was contradicted by polls showing 87% of the region's population opposed secession from Estonia. In 1993, dissatisfaction with newly enacted citizenship and election laws (non-citizens were not allowed to hold office) culminated in the Narva referendum of 16–17 July 1993, which proposed autonomy for Narva and Sillamäe, a nearby town. 97% voted in favor of the referendum, though turnout in Narva was 55% and there were credible charges of vote rigging. Russian residents nowadays are happy with their status as Estonian citizens and live peacefully alongside their compatriots. After 1991, there have also been disputes about the Estonian-Russian border in the Narva area, as the new constitution of Estonia (adopted in 1992) recognizes the 1920 Treaty of Tartu border to be currently legal. The Russian Federation, however, considers Estonia to be a successor of the Estonian SSR and recognizes the 1945 border between two former national republics. 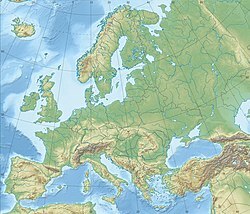 Officially, Estonia has no territorial claims in the area, and  which was also reflected in the new Estonian-Russian border treaty signed in Moscow in May 18, 2005. Russia didn't ratify it because together with the ratification Estonian parliament approved a communiqué which mentioned the Soviet Occupation. In February 18, 2014 a new border treaty was signed by both countries. The treaty must still be ratified by the parliaments of both Russia and Estonia. On 1 January 2013 Narva's population was 62,078, down from 64,667 inhabitants two years earlier. The population was 83,000 in 1992. 93.85% of the current population of Narva are Russian-speakers, and 82% are ethnic Russians. Most non-Estonians are ethnically Russian, Belarusian, or Ukrainian immigrants or the children of immigrants, though 69% of Narva residents in the early 1990s had been born in Narva or had lived there for more than 30 years. Ethnic Estonians accounted for 3.86% of total population. Much of the city was destroyed during World War II and for several years during the following reconstruction the Soviet authorities largely prohibited return of Narva's pre-war residents (among whom ethnic Estonians had been the majority, forming 64.8% of the town's population of 23,512 according to the 1934 census), thus radically altering the city's ethnic composition. Nevertheless, ethnic Russians had already formed a significant minority: 29.7% of the city's population were Russian in the census of 1934. 46.7% of the city's inhabitants are Estonian citizens, 36.3% are citizens of the Russian Federation, while 15.3% of the population has undefined citizenship. A concern in Narva is the spread of HIV, which infected 1.2% of Estonia's population in 2012. Between 2001 and 2008, more than 1,600 cases of HIV were registered in Narva, making it one of the worst areas in Estonia, alongside Tallinn and the rest of Ida-Viru County. The HIV infection rate in Estonia declined in 2014, with 59 new cases in Narva. Narva is situated in the eastern extreme point of Estonia, 200 km (124 mi) to the east from the Estonian capital Tallinn and 130 km (81 mi) southwest from Saint Petersburg. The capital of Ida-Viru County, Jõhvi, lies 50 km (31 mi) to the west. The eastern border of the city along the Narva River coincides with the Estonian-Russian border. The Estonian part of the Narva Reservoir lies mostly within the territory of Narva, to the southwest of city center. The mouth of the Narva River to the Gulf of Finland is about 13 km (8 mi) downstream from the city. The territory of Narva is 84.54 square kilometres (32.64 sq mi). The city proper has an area of 62 square kilometres (24 sq mi) (excluding the reservoir), while two separate districts surrounded by Vaivara Parish, Kudruküla and Olgina, cover 5.6 km2 (2.16 sq mi) and 0.58 km2 (0.22 sq mi), respectively. Kudruküla is the largest of Narva's dacha regions, located 6 km (4 mi) to northwest from the main city, near Narva-Jõesuu. Narva has a warm-summer humid continental climate (Köppen climate classification Dfb). Narva is officially divided into 15 neighbourhoods, which carry no administrative purposes. Their names and borders are defined. The neighbourhoods are: Elektrijaama, Joaoru, Kalevi, Kerese, Kreenholmi, Kudruküla, Kulgu, Olgina, Paemurru, Pähklimäe, Siivertsi, Soldina, Sutthoffi, Vanalinn and Veekulgu. Narva is dominated by the 15th-century castle, with the 51-metre-high Long Hermann tower as its most prominent landmark. The sprawling complex of the Kreenholm Manufacture, located in the proximity of scenic waterfalls, is one of the largest textile mills of 19th-century Northern Europe. Other notable buildings include Swedish mansions of the 17th century, a Baroque town hall (1668–71), and remains of Erik Dahlberg's fortifications. Across the Narva River is the Russian Ivangorod fortress, founded by Grand Prince Ivan III of Muscovy in 1492 and known in Western sources as Counter-Narva. During the Soviet times Narva and Ivangorod were twin cities, despite belonging to different republics. Before World War II, Ivangorod (Estonian: Jaanilinn) was administrated as part of Narva. Narva Kreenholmi Stadium is home to Meistriliiga football team, FC Narva Trans. Emmanuel Steinschneider (1886–1970), one of the top USSR infectious diseases specialists, professor. In the first-person shooter video game Squad, the map Narva is loosely based on the real city, containing the Narva Castle, the Ivangorod Fortress, as well as a less similar industrial area in the south side of the city. ^ "History of Narva: Formation of city". Narva Museum. Retrieved 19 March 2009. ^ Kriiska, Aivar; Lavento, Mika (2006). "Narva Joaoru asulakohalt leitud keraamika kõrbekihi AMS-dateeringud". Narva Muuseumi toimetised (in Estonian, English, and Russian) (6). ^ Raik, Katri (2005). "Miks pidada linna, eriti Narva sünnipäeva?". Narva Muuseumi toimetised (in Estonian) (5). ^ a b c Kivimäe, Jüri (2004). "Medieval Narva: Featuring a Small Town between East and West". In Brüggemann, Karsten (ed.). Narva and the Baltic Sea Region. Narva: Narva College of the University of Tartu. ISBN 9985-4-0417-3. ^ a b c d e "History of Narva: Narva fortifications and Narva Castle". Narva Museum. Retrieved 19 March 2009. ^ "History of Narva: Timeline". Narva Museum. Retrieved 25 March 2009. ^ a b c Raun, Toivo U. (2001). Estonia and the Estonians. Stanford, United States: Hoover Institution Press, Stanford University. ISBN 0-8179-2852-9. ^ a b c d e Batt, Judy; Wolczuk, Kataryna, eds. (2002). Region, state and identity in Central and Eastern Europe. London, Portland: Frank Cass Publishers. p. 222. ISBN 0-7146-5243-1. Retrieved 12 November 2009. ^ Нарва: культурно-исторический справочник [Narva: kulturno-istoricheskiy spravochnik] (in Russian). Narva: Narva Museum. 2001. ^ a b c d e Kattago, Siobhan (2008). "Commemorating Liberation and Occupation: War Memorials Along the Road to Narva". Journal of Baltic Studies. 39 (4): 431–449. doi:10.1080/01629770802461225. ^ a b Faure, Gunter; Mensing, Teresa (2012). The Estonians; The long road to independence. Lulu. p. 23. ISBN 9781105530036. ^ "History of Narva: The Old Town of Narva". Narva Museum. Retrieved 19 March 2009. ^ a b Vseviov, David (2001). Nõukogudeaegne Narva. Elanikkonna kujunemine 1944–1970 (in Estonian and Russian). Tartu: Okupatsioonide Repressiivpoliitika Uurimise Riiklik Komisjon. ^ "Katri Raik: Eesti, Venemaa... Ei, ikka Eesti". Delfi. ^ "Estonia and Russia: Treaties". Estonian Foreign Ministry. Archived from the original on 2 January 2011. Retrieved 12 November 2009. Estonia sticks to its former position that it has no territorial claims with respect to Russia, and Narva presently sits peacefully within Estonia's borders. As such, Estonia sees no obstacles for the entry into force of the current treaty. ^ Berg, Eiki. "Milleks meile idapiir ja ilma lepinguta?". Eesti Päevaleht (in Estonian). Retrieved 27 September 2009. ^ "Enn Eesmaa: väide Petseri-soovist on ennekõike provokatiivne". Eesti Päevaleht (in Estonian). Retrieved 27 September 2009. ^ "After 20 years, Russia and Estonia sign border treaty". Reuters. ^ a b c "Narva in figures 2010" (PDF). Narva City Government. Retrieved 29 November 2011. ^ a b c "Narva in figures 2008" (PDF). Narva City Government. Retrieved 12 November 2009. ^ Rahvastiku koostis ja korteriolud. 1.III 1934 rahvaloenduse andmed. Vihk II (in Estonian and French). Tallinn: Riigi Statistika Keskbüroo. 1935. hdl:10062/4439. ^ "HIV infection rate slows in Estonia"
Wikimedia Commons has media related to Narva. Wikivoyage has a travel guide for Narva.